One year ago today, the Cedar River in Cedar Rapids hit a record crest of just over 31 feet – 19 feet above flood stage. Residents and business owners say the city still has a long way to go to recover. Lee Belfield just reopened his downtown business, Zins restaurant, this week. Belfield says the flood destroyed nearly everything, but friends helped him reopen. "We had no idea we had so many friends and no idea the friends we have are such good friends," Belfield said. While businesses are beginning to bounce back, Gary Ficken says the real test is yet to come. Ficken is with the Cedar Rapids Small Business Recovery Group. "In two years, June 2011, will be the real snapshot of how the Cedar Rapids business community survives," Ficken said. Government statistics show about 40% of businesses that reopen after a natural disaster are out of business two years later. Ficken says he believes up to 300 flood-impacted businesses in Cedar Rapids could close for good without more financial help. That translates into about 7,000 jobs. Homeowners, meanwhile, are struggling with buyouts. Dennis Ades moved out of his Time Check Neighborhood home which was buried under water. "I lost all my personal possessions, I got out my cat, my cars and two weeks of clothes," Ades said. He has refused to participate in a federal buyout program, because his flood insurance payment would be deducted from any buyout. In addition, if he takes the buyout, he won’t get pre-flood assessed value. 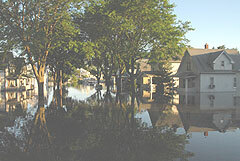 Ades bought a home in nearby Springville with his flood insurance money. Bev Dittmar and her boyfriend also lived in the Time Check Neighborhood, and like Ades, are refusing a buyout because they had flood insurance. "I lost my refrigerator, my washer and dryer, a stove, dressers and all of my clothes," Dittmar said. "My cabinet was full of stuff that my grandma had given me and she’s gone." Dittmar’s longtime boyfriend owns the house. They say the flood insurance payout covers the old mortgage with not enough leftover for a new place. And the $15,000 they would expect from a buyout wouldn’t be enough to own a house they want. So, for now, they’re staying put and waiting for a bigger payout that might never come.